10212 Imperial Shuttle is an Ultimate Collector's Series Star Wars Classic set that was released on September 1st, 2010. It contains 2503 pieces. Included are Darth Vader, Imperial Pilot, Imperial Officer, Stormtrooper and Luke Skywalker (Jedi Knight) minifigures. The Lambda-class T-4a shuttle was a standard light utility craft in common use throughout the Imperial military as a transport for troops and, more often, high-ranking individuals, like Darth Vader and Emperor Palpatine. In the LEGO Fall 2010 Catalog, LEGO labeled the Imperial Officer as a Shuttle Pilot, and the Shuttle Pilot as an Imperial Officer. This is a description taken from LEGO.com. Please do not modify it. 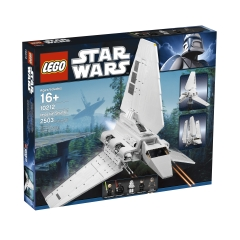 (visit this item's product page) Now you can build this iconic Star Wars™ vehicle in true minifigure scale for the first time! Facts about "10212 Imperial Shuttle"
This page was last edited on 18 August 2017, at 00:42.